I was recently asked where would be a good place to stay for a first time trip to Maui and my immediate response was Kaanapali. Now this is not to say that there aren’t other fantastic places to stay in Maui, on the contrary! In my opinion, Kaanapali offers the amenities that suit most first time Hawaii vacationers’ needs and desires. So, why does Kaanapali make a great Hawaii vacation base? Kaanapali has a great beach. In fact, Kaanapali Beach won the number one spot in 2003 from Dr. Beach. This golden sand beach is more than three miles long and has a wonderful path that hugs the beach. I love this path for exercise or a romantic walk. It is beautiful in the evenings when the tiki torches are lit and you hear the waves crashing on the shore and the wind swaying the palm trees. Black Rock near the Sheraton Hotel on Kaanapali is a great snorkeling spot in Maui. Kaanapali has a great mix of shops, restaurants, and activities that are all within walking distance. I love being able to walk to restaurants when I’m on vacation and there is a great selection of restaurants at Kaanapali Beach Resort. Whalers Village is centrally located within Kaanapali and there you’ll find shops restaurants, a whale museum and free entertainment. From golf to tennis to snorkeling to spa pampering, you’ll find a just about anything you want to do right in Kaanapali. Kaanapali has a good location. As real estate gurus say, “location, location, location.” Kaanapali Beach has wonderful sunset views with the islands of Lanai and Molokai off in the distance. This location is as good as any for exploring Maui. The resort is located about 45 to 50 minutes from the airport and only about five minutes from historic Lahaina town. 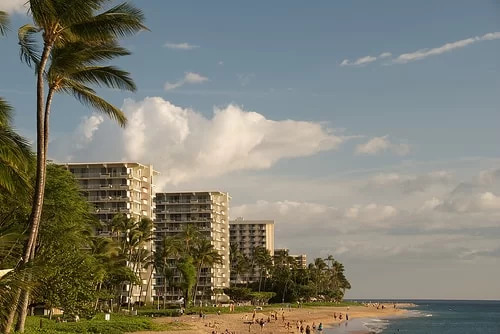 Kaanapali has a mixture of condos and hotels to meet most budgets. Most hotels are in the four-star range. Is Kaanapali perfect for me? So, you might be wondering if there are any downsides to Kaanapali and there is a very minor one worth mentioning. First, it can be crowded in spots, but not as a whole. The southern end of the beach tend to be more crowded in my opinion as the beach is extremely thin in that area. If you want to lounge on the beach, then stay at a resort on the middle to northern end of the beach. 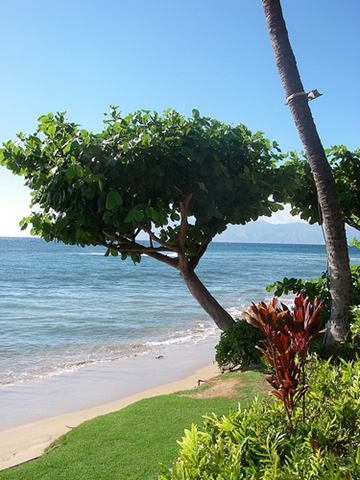 Have you vacationed at Kaanapali Beach? What did you think? Hey I saw your post on problogger must say impressed with domain name and blog it self. I run hawaii blog as well, you might came a cross? Well talk to you later. Thank you, Bontb. I will check it out. Nice notes and thanks for the sharing the link to the Jane Fullwood article. Ka’anapali is definitely our favorite place to stay when we’re in Maui. He shack up at the Sheraton Maui Resort each year, and while we splurge for the super-duper ocean front rooms on the north side of Black Rock, there are still so many options along Ka’anapali Beach. A few favorites of our own, to help others not familiar with the area. 1) There is a Safeway at the Lahaina Cannery Mall right down Hwy 30 that’s great for stocking up on supplies for a week’s stay. 2) We love walking to Whalers Village at least once a day. You have great places to eat like Hula Grill and Leilani’s, and you always have the ABC Store there for all your needs. 3) There is a beachwalk that goes from the Sheraton all the way down to the Hyatt along the beach. Its about a 30 minute gingerly walk from north to south, one way. We enjoy it as a great daily workout and a neat way to check out the other resorts and condos along the beach. 4) Nightly strolls along the beach. With so many resorts and people gathering around Ka’anapali, you’d think there would be more people strolling down the beach after dark. We routinely walk back to the Sheraton from dinner at Whalers Village and take our time through the sand. To our surprise, there really aren’t that many people to be seen. It’s like having the beach all to yourselves. The torches atop Black Rock at the Sheraton also offer for unforgettable scenery. If you enjoy watching the stars, bring a towel or beach blanket and you’re in heaven. 5) Speaking of Black Rock, the Sheraton has a nightly torch lighting and cliff diving ceremony at Black Rock, right around sunset. It’s definitely something to see at least once, and you’ll find many people gathering around the sands of Ka’anapali Beach and cocktail cruise boots lining up in the water to witness the event. 6) You have a few great choices of luaus right nearby. The Sheraton has one twice a week, you have the ever popular Drums of the Pacific down near the Hyatt, and the Royal Lahaina Luau over at the Royal Lahaina are all great choices. 7) You’re about 10 minutes from Historic Lahaina Town and while parking can be an adventure at certain times, it’s a quick drive down to a very happening Front Street for shopping, dining, and dinner cruises from the harbor. 8) The sunsets from West Maui are absolutely amazing (although to be fair, they’re great anywhere on the islands). No matter what you’re doing around 6:30pm, everyone stops and takes in the majestic beauty of the sun setting out on the Pacific Ocean. Thanks for sharing your thoughts, Kris. We were just there in September 07 as well. Hi, Sheila–Mike S. referred me to your site. It’s fantastic–what a great job you’ve done! I love Maui–Jim and I were married there and everything was top notch. We’re thinking of taking the boys (they’ll be 11) in the summer of 2010. Any tips on traveling in HI with kids? Aloha Pam!! Great to hear from you!! Wow, it’s hard to believe your boys will be 11 next year! I still picture them as toddlers. I think there’s so many interesting things to learn in Hawaii for adults and kids – like marine biology (snorkeling), geology (volcanos), meteorology (the multiple climates in Hawaii), and history and Polynesian culture – to name a few. – Swim at lifeguarded beaches only. Thanks for your comment and I hope you’ll come back often to enjoy a little slice of Hawaii each day and share your experiences from your trip to Maui. I’ve stayed there several times. Great beach, great location. Back in 2004, the Hyatt had a nice beach area, but it is much thinner now. They used to have cabanas on the sand, but had to move to the grass. Safeway and especially Longs (same shopping center) are great places to stock up on stuff. I find Longs to be very reasonable. The Times Market (Formerly Star Market) is kind of pricey, but they do have that great Arturo’s salsa there. We love the Hyatt, and the Westin Ka’anapili Resort Villas. Love the walking path and the sunsets in this area.